Everyone in our house loves bath time (well except for Dasher boy). Isla loves the warm water and playing with the soapy bubbles. Drew and I love seeing how happy and smiley she gets whenever we put her in the bubble bath! Isla is always eating her hands, so I love that The Honest Company’s products are not made with harsh chemicals. Instead they are safe and super gentle on her skin. I love that I never have to worry if she gets soap in her eyes or in her mouth. For Isla we use the Honest Shampoo & Body Wash or Bubble Bath and then put lotion on to keep her skin smooth and soft. If she has any dry spots, we put the Organic Healing Balm on to help moisturize her skin. Once Isla is bathed and ready for bed I usually light a candle and hop in the bath myself. There’s nothing I love more than a warm bubble bath! 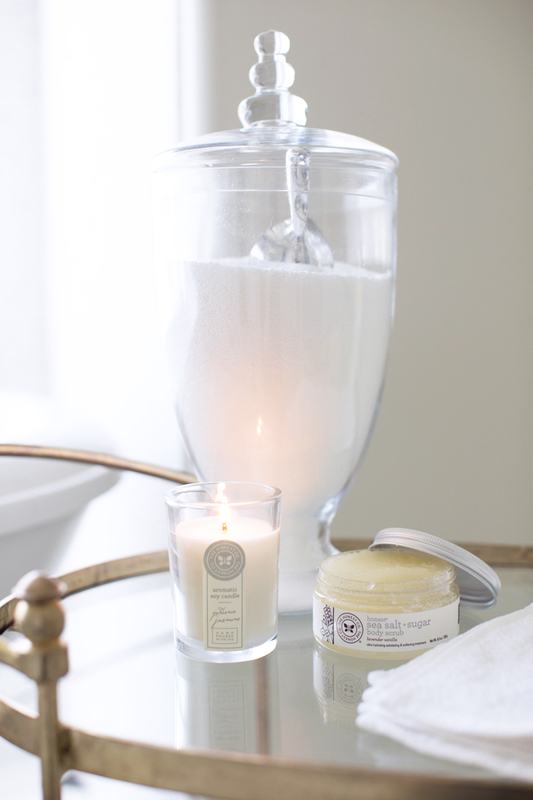 I use the Honest Body Scrub and I love that their scented candles instantly create a calm and relaxing atmosphere. The perfect way to end my night! 1. If you’re not already a member, join The Honest Company at honest.com. 2. Leave a comment on this blog post letting us know which product from Honest you are most excited about. One winner will be picked at random and announced one week from today, August 25. Be sure to check back! **No purchase is necessary to enter or to win. Odds depend on the number of eligible entries received. Must be US resident, 18 years or older. Must enter by August 24, 2015 at 11:59 PT. See official rules for complete details. This post has been sponsored by The Honest Company who provided product and payment. All opinions are my own. Lovely photos and Isla is so adorable! Honest products seems to be good! Rachel, your little girl is so precious! What a sweet moment with your family. That dress you are wearing is so adorable! Awww!! Such a sweet post with beautiful photos and great product placement! I love Honest products and use them daily for myself and my daughter. I’m obsessed with the surface cleaner and hand soap. They are great products and clean very well too in a safe manner. So sweet! Isla looks so happy!! I love the Honest sunscreen! Perfect for my fair skinned kids who have bad reactions to most children’s sunscreen except The Honest Co! Loving these photos, so adorable! Also, love your kitchen rug, where is it from?? I want to try the new facial wipes! We love all the bath products they’re the only ones I’ve every used on my girls! She is just adorable!! I love how happy she is when she is looking at you two!! So sweet!! Isla looks so happy! What a sweet post! I absolutely love the Honest products. I have been using them throughout my pregnancy and am so excited to use them on my little one! Love the bubble bath! I am most excited to try the sea salt & sugar body scrub! I am most excited for the body scrub! I have very dry skin so this will be very beneficial for me! I use many of the Honest products with my little one. The healing balm has been a lifesaver for his dry spots! Personally, I’m excited to try the new line of tampons and look forward to the upcoming beauty products! So cute! Bath time for little ones can be kind of stressful, but those moments can be some of the most adorable! Love this post! I would be most excited about the Healing Balm! Always in search of dry skin cures:)! Thanks for the giveaway! I have been meaning to check out the Honest Company & am most interested in trying the multi-surface cleaner! These bath time photos are adorable! Isla’s big smile is the best! Personally I love & use the wipes for everything! I keep the large dispenser at home and throw the travel size in all my bags for on the go! These photos are so sweet. I’m a fan of Honest products – and my fav right now is actually their shaving oil! Beautiful photos! Isla is just too cute. Beautiful photos! Isla is adorable! I would love to try Honest’s bubble bath! I’ve been looking for a good one that’s super bubbly and that looks like it fits the bill perfectly! The bubble bath is the only bath product that I haven’t tried yet! I love the healing balm! Those pictures of your smiley baby are too cute! I love how happy she is in that bath, and I agree nothing is more relaxing and soothing. Isla is the cutest little baby! Love your white dress too! I absolutely LOVE the organic body oil! I’ve always heard great things about the Honest Company and always wanted to try them. I am not a mother myself, but would love to experience that dream some day and the Honest Products seem a great option. I personally love baths myself, especially when they involved body scrubs/ I’ve tried so many different types, from too oily to too dry and have yet to find the perfect one!!! So, I’m most excited to try the Honest Body Scrub. Thank you Rachel and The Honest Company for hosting this giveaway; it’s awesome! Such cute photos of your family! I would love to use the bar soap and body scrub. Isla looked so yummy in her bath. I love-love all your posts. Where can I purchase the dish towel you have in the post? PS – I have already ordered a bunch of the Honest products. Thank you for sharing! Your daughter is beautiful! What lovely photos! Love your bath time photos! You and your family look so cute :) Honest products are great too! I would love to try the Bubble Bath! I would love to try Honest cleaning products! Love the Honest products and am so excited to try the candles!! Love the the smell of the bubble bath can’t wait to start using it. Camera. You’re baby girl is so precious. Diapers for my baby girl since she was born. She’s 1 month and she loves them! My favorite products so far are the body wash and healing balm. My fiancé using the balm for his feet that get really dry from his cycling shoes. We are three months product and I have become a member of Honest company. I cannot wait to use the products for our little one. I’m so excited to use the bubble bath on my little one! I absolutely love how the products are not only safe and gentle, but they smell great too! Bubble bath is always a fantastic thing to have!! Love the shampoo and body wash! Lovely pictures! Thank you for sharing information on Honest. I’m excited to try the soy candles. My first baby (it’s a boy! He shall be called Daniel Gabriel) is due on Christmas Eve. We live in Chicago and our winters can get pretty harsh. I am excited to use the honest products, but I am most excited about the Organic Healing Balm. Regardless of our crazy unpredictable weather I want my baby’s skin to get all the tlc it needs to stay smooth and healthy! Hi Rach! I just wanted to start off by saying you have the most adorable baby girl and I absolutely love your blog! After reviewing the products Honest has to offer and although I’m not a mother I was intrigued by the Organic Shave Oil. No matter what I try my skin is always dry after shaving even after using a moisturizer and exfoliating in the shower! (My frequent struggle. I mean first world problems right?) getting the chance to try these products out would be amazing and hopefully they’d be able to resolve my dry skin issue. Anyway, thanks for reading and I wish the best of luck to everyone who enters this contest! I love the pictures! My husband and I have been wanting to try the Honest products for awhile now. Most looking forward to trying the diapers and sunscreen! Thank you for sharing! I have been wanting to try Honest products but was interested on the opinion of other moms. You have definitely eased my mind with just how wonderful it truly is. We are expecting our second in February, so I am most excited about the shampoo and body wash! The candle looks heavenly as well! Beautiful home and beautiful pictures! Beautiful pics!! I can’t wait to try the bubble bath with my little soon! I had no idea they had candles! Love the smell of their bath products so super excited to get one of the candles! And I can’t wait to try their candles. Let me just start off by saying you have the most adorable baby girl! After reviewing and reading about the products honest has to offer, although I am not a mom yet, I was intrigued by the Organic Shave Oil. I suffer from very dry skin, especially when I shave. I’ve tried everything, all moisturizers, exfoliators, the whole nine yards, but nothing seems to work. Maybe given the chance to test these products out would finally help! Thanks for reading and the best of luck to everyone entering this contest! The bubble bath because my 2 year old daughter LOVES bubbles. She also likes to eat them, so to know the product is safe makes this momma not worry. I am most excited about the bubble bath! Can’t wait to try the body scrub!! I LOVE the healing balm! I use it on my lips at night and mix it with the Honest Co. lotion when my son’s skin is really dry. I’ve been wanting to try the scrub and candles, they look awesome! Bubble Bath! Would absolutely love to give this to my best friend who just became a mama! The two of them would love! I am most excited to try the bubble bath! What a cute bubble bath! So adorable! My favorite Honest product is their lavender hand soap. It smells so so good! I would love to try the shampoo and body wash! The bubble bath! And the candle too! Who does love that combo!! Love everything that the Honest Company stands for. My little guy, Kieran, also has his hands in his mouth all the time – so body wash without harsh chemicals are a must! Great Review! I love the Honest Company and have been trying quite a few of their products and like most of them so far! I have been really wanting to try the Sea Salt & Sugar Scrub and the Soy Candles! I am the most excited for the ease of the diaper bundles sent each month and for the bubble bath to give my sweet baby girl coming soon bubble baths in every evening! This is awesome! I’d be most excited about the multi-surface cleaner or the dishwasher gel! I have a new born who is three weeks old and have the bundle for diapers and wipes. I love how they are organic and gente to her skin. Baby at bathtime is just the cutest and you two are the most adorable mother daughter combo! Practicing yoga opened my eyes to living more consciously while keeping the environment and the health of myself and loved ones in mind. I’ve watched so many documentaries and researched just how much toxins and chemicals are in our food supply, makeup, soap and skin care products, cleaning products, baby products, etc. and it’s so alarming and scary! (ie. http://thehumanexperimentmovie.com/switch-to-safer/) As a result, I’m making an effort to really research and be conscious of where I spend my money and what I use in my daily life and Honest Co. looks like a great choice! I’d be happy to try any of their products and hope to do so in the future. Love the Multi-surface cleanser. Actually I love all their products, it’s so natural and chemical free! I would LOVE to try all of these products, but especially the Organic Healing Balm. My daughter has had that pesky cradle cap and I’m sure the Healing Balm would work great on it! It sounds like I need to try their candles. I would love to try the candle! How relaxing! The Honest product I am most excited to try would be the Honest Multi-Surface Cleaner!! There are tomalley product out there with harmful chemicals, even ones in stores that pose as being “natural” or safe for baby! Isla’s smile is so adorable! I bought some Honest products for my baby niece and we are loving them. They are amazing! I especially love their healing balm; I keep one in my purse at all times. Their hand sanitizer also smells awesome! Isla’s smile is so adorable! I love Honest products! I recently bought a few for my baby niece and we love them. I especially love their healing balm; it’s amazing and I keep a small one in my purse at all times. Their hand sanitizer also smells great! I am most excited about trying the body scrub, looks like it will smell good and leave my skin soft! This is so precious! I should be trying honest products since I believe what Jessica Alba believes. I wanna try the body wash. I am due this February and have ready purchased some of the honest products. I am most excited about the shampoo and body wash!! I recently had a baby and I rapidly became obsessed with the honest company products. From diapers and wipes to shampoo/ body wash and lotions to household items and now feminine products! I love it all. Great photos by the way! I am a becoming a huge fan of the honest company products. I have a 5 week old who I have used the diaper rash cream on and I love it. I would love to try the bubble bath along with the shampoo and conditioner. Im sorry shampoo and body wash. I am most excited about the body scrub and candle! I would love to try out that candle. Isla is so cute!! And I love the honest products!! I haven’t tried their body scrub, I need to try that!! I love how happy she looks!! What a cutie! I am having twins in about two months and have been wanting to get the bubble bath for them. I love all of the Honest products. Especially the Belly Balm. It works wonders. I love Honest’s once a day prenatal and men’s vitamins as well at their DHA pills! It’s great knowing I am putting such great things inside my body to help our baby! Love all the pics! I’ve heard great things about Honest, I would love to try body scrub and the shampoo and body wash for my baby! Done:) I have a little one also, so we’d love to try the bubble bath or shampoo! That candle looks amazing also. Thanks for the opportunity! Love the Honest products especially their healing balm. Isla looks so sweet in her little bath!! What an angel!! I am really excited to find that Honest has a diaper rash cream. My niece and nephew both have very sensitive skin (I think they inherited it from their auntie) and are prone to break out in a rash at the slightest provocation. My niece is pretty much out of diapers now, but my poor nephew is following right in her footsteps when it comes to diaper rash. I was a nanny after college and have tried TONS of diaper rash creams and recommended them to my sister, but none has worked consistently for her delicate little babies. She works full-time and needs a simple solution that her nanny can implement while still keeping an eye on all four kids! The honest cream looks perfect for the job! With all natural ingredients, and power moisturizers like jojoba and coconut oil, this diaper cream may be the answer to my nephew’s diaper blues (or I suppose reds in this situation). Thanks for sharing this great company! I love the Honest diaper cream! It works great for my little guy! I absolutely love the Honest Company! As a new breastfeeding mom, I haven’t been able to do so exclusively due to low milk supply. As a result, I’ve had to supplement with formula and no other formula works better for her than the Honest Company organic premium formula! Because it is carefully modeled after breast milk, I believe my child is getting quality milk and therefore it is my favorite product from the brand! I love this brand! I was browsing Buy Buy Baby and picked up the sanitizer spray, it smells glorious! It’s not harsh and strong like other sanitizer’s! I am most excited about the cleaning products, I love knowing that once my little boy arrives I can safely keep a clean environment for him with our worrying about the chemicals I am using. I love this brand for so many reasons – it was created by a woman! It was created by a mommy! It stands behind and is exactly what its name is – HONEST! It is not overpriced for such a high quality product and it creates products that are environmentally friendly and safe! I am most excited about the 4-in-1 Laundry Packs. Cute family! Those pics are so cute. Isla is getting so big! I love your blog! Thank you for sharing your life as a new Mom. Isla is so adorable! I can’t wait to try the Diaper Bundle and Essential Bundle when our baby arrives this winter! I am most excited about the Sea Salt & Sugar body scrub! Precious moments, you guys look lovely. Isla is adorable, just like her mommy. I would love to have a chance and try the honest bubble bath, shampoo and multisurface cleaner. All of them looks good quality and gentle products for our little ones. These photos will be cherished forever! It is the sweetest to see little Isla smile so big for bath time :) You all are such a beautiful family! I have a lil one on the way and am very excited about trying the whole honest package… Specifically the cute little diapers & the healing balm! I would love to try the bubble bath!! These photos are beautiful and perfectly capture bath time happiness! Let me start by saying how much I love all the fun, colorful and beautiful the honest diaper prints are. I have only had a pleasure of trying a few products due to my budget. I must admit my favorite item aside from the diapers, has to be their baby wipes. The little semi rounded diamond shape makes it very easy for gripping the baby wipe when cleaning a very soiled bottom. Two years of no mess on my hand from a dirty diaper with my second boy. The wipes do help me a lot not only from cleaning messes but my boys used them for just about anything they can think of. Not to mention my two year old has always had a very sensitive bottom and honest has been the only kind of diapers and wipes that don’t flare up any rashes, bumps, or any other allergic reactions. After trying many brands and products I’m glad I found the honest brand. Thank Jessica Alba for making something so great for all the babies and parents around! Thank you Rach for this opportunity! Beautiful photos! You have everything all together! Your baby girl is adorable! So excited about the Honest spray sanitizer especially with a newborn. I’ve also heard great things about the vegetable and fruit cleaner. The cutest photos! Such a sweet family! I enjoy some of the Honest Co. products. One thing I thought I’d mention to you is that you’re not supposed to give baby girl’s a bubble bath. For the same reason we women aren’t supposed to have them, natural product or not, it can irritate their little female parts due to the fragrance, even if it’s essential oils. I want to try the Organic Breath Easy Rub next time by little babe is sick (although I wish she would never get sick!) I have heard great things! i love the organic healing balm!! It’s my favorite to use on my baby boy! We love the Honest company bath products! My babies aren’t as much babies anymore, but we still love that we don’t have to worry about harsh chemicals on their skin! I would love to try their cleaning products, as they’re the only thing I haven’t tried yet! The bubble bath safe for children! Beautiful pictures! I love Honest shampoo and their lip balms. Love the body wash and shampoo!! Love all honest!! Definitely the candle. I love all honest products and use them in place of the leading brand. But not many places offer a candle. I use all go eat bath products but once babies are asleep, the candle is what I’m lighting after a long day. We are obsessed with the healing balm! Perfect not just for baby, but for the whole fam. Thank you Honest for having the most amazing products!!! Beautiful pictures! My family uses various Honest products and I am most excited about the fruit and vegetable spray that removes wax since I make my daughter’s food daily. I have yet to try any honest products, but I’d really love to! Their all purpose cleaners and candles look really good! I am most excited about the honest shampoo and body wash! Cleaning the family, including my five month old son without harsh chemicals is super exciting. The scent is also so calming! Love! I recently ordered my first essentials bundle but I think I’m most excited about the organic healing balm! I’ve heard nothing but great things about it. Love all Honest products. The Honest Floor makes me wanna dance. No harsh chemicals!!!! I have two little ones and only use honest products at home! Love the cleaning , dipers , bath, sunscreen, all honest products are wonderful , have to try now the deodorant and pads. Shampoo / Body wash for my little one due to arrive in November and the candle for me! Love the Honest Comapny products! I would love the candles and organic moisturizer because my kids’ skin is very sensitive! I love the honest shampoo & body wash. I use it on myself. Have you tried the dish soap for bottles? It’s the only thing I will use when washing her bottles and any of our dishes now. What a beautiful (and honestly clean) family you have! I recently discovered the Honest Company and love their products. I would like to try the deoderant, toothpaste and bubble bath. I also didn’t realize they had candles. Thank you for this sweet post. I’m in love with the honest company and their products! The healing balm is the only thing I can use on my baby when she has a rash, and my sons dry skin. I love how it doesn’t sting their skin! By the way you have a beautiful family! L O V E the healing balm for everything and everyone in my household. The stuff is magical and worked for some many scratches, scrapes, rashes and even dry skin! I love this post. I most of the honest baby product on my 8 month son Mason. I love that it can trust honest with my baby’s skin! I haven’t tried the honest candle that you mention but I will do so soon! I am also excited to try the bubble bath! I am excited about the bubble bath!! And the shampoo smells so good! The multi surface cleaner is freakishly powerful and on the flip side, the shampoo/body wash is so gentle on my daughter’s (and my) skin but cleans her hair so well after a day of play. It’s amazing to have two products both made from clean ingredients. Would love to try a candle! I would absolutely love the bubble bath! I used the Honest prenatals and have been dying to try the soaps on my daighter because I know they will be safe on her little skin! I love your blog Rach!! Congrats on being a new mama, you’re doing a great job! I’ve always wanted to try the body scrub. I’ve always used many brands of body scrubs but some end up leaving my skin really raspy and dry. Can’t wait to try it and see how it leaves my skin. I am itching to try that body scrub! I am excited about trying the Honest body scrub. Ive tried other brand scrubs and they end up leaving my skin rashy and dry. I really hope to try the scrub soon and see how it leaves my skin. Excited to try the shampoo and body wash! I really enjoy the healing ointment. I use it on just about every skin irritation my family is faced with! It can handle any ailments and I love the fact that all ingredients are natural. Makes me feel very comfortable using Honest product on a daily basis! I love the honest company but I haven’t had a chance to try everything I’m really excited to try the bubble bath cause my daughter loves her bubbles ad it’s hard to find a good clean bubble bath that doesn’t make her break out or leaves a funky residue on her skin after. These bundles would be awesome for our family sincere just had a new baby ? I am excited about using the wipes and diapers on my little bundle of joy, when he gets here. I have already been using the face/body lotion and I Love It. The Healing Balm is our favorite, we use it for everything! Eczema, diaper rash, winter dry skin, it heals it all! written by means of him as no one else recognize such special about my difficulty. I love the Honest’s Shampoo & Body Wash! I even use it as a facial cleanser! PS You have a lovely family. The bath scrub looks amazing! I’m am in love with the honest mopping pads. They have a wonderful fresh scent and have amazing scrubbing power for eveven the most stuck on messes. Plus with the fact that they’re natural I can rest assure that my family is not being affected by harsh chemical cleaners. Love love their conditioner and detangler!use them.on my girls very curly hair and it works. I love the healing balm and am excited about the new feminine products! I’ve been using the honest shampoo for the last two years, it’s so wonderful that I doubt I’ll go back to something else ever! I’d love to try the healing balm! My son has dry skin spots on his stomach and back. You are such a good mom the baby looks so happy at bath time. Too cute! Love all the products we have tried so far, but I really want to try the sea salt and sugar body scrub! I just became a member on the honest page. I have to say, I have yet to use any products but I did order diapers for my son who arrives in just 2 weeks! I would love to try the bubble bath, and the shampoo/body wash. I am looking for natural/ safe products for my newborn, And your daughter looks so happy enjoying her bubble bath!! I love everything and started to use when I had my son a year ago. I love the items for me , but I was so excited when the came out with their feeding line. When I stopped nursing it was comforting to give my son the next best thing. My favorite honest product is the bubble bath! I love how it smells, and how soothing it is – for both my babies and me! What a sweet baby Isla is! <3 Also, loveeee your kitchen sink! I love so many of the Honest products for my children, especially for bath time and washing hands. Isla is getting so big now! I use all the same bath products and I love them all! I have used Honest’s products for a while now and love them! The hand soap is one of my favorites. I’m excited to try the candle, I hadn’t seen those yet! I love the honest products! The body oil is my favorite! We can’t wait to use them on our baby. We use Honest diapers and wipes in our house but would love to venture out and try other products! Their soaps sound awesome and I would LOVE to try one of their candles! I’m most excited to try their baby bath products! Pretty pictures! my favorite product would definitely be the diapers…they are too cute! Also love the chemical free dish products. Your daughter is so adorable! I just recently started using Honest products and I have to say I’m very pleased. I love the laundry products and my kids love the kids honest toothpaste! I would definitely recommend these products to my friends and family. We love the Honest company diapers and wipes for our new baby boy!! I also love their dryer sheets and laundry detergent for the entire family! I’ve loved everything that I have tried from Honest. Need to buy the candle next. Thanks for the post. Beautiful Happy photos! Would love to try the healing balm, heard such good things! Your little Isla is so adorable! I really want to try the body scrub and the 3 in 1 facial towelettes! I love honest products!! My very favorite are the hand sanitizer spray and the honest sunscreen. Having four kids, I need natural products and these are my very favorite! I’m most excited about the sea salt & sugar scrub because I haven’t tried that one yet! I use all their other products and get so excited every time a new one comes out. I want every product in my house to be Honest, and hope, along with the new Honest Beauty line, that they will soon evolve into clothing for mommies. 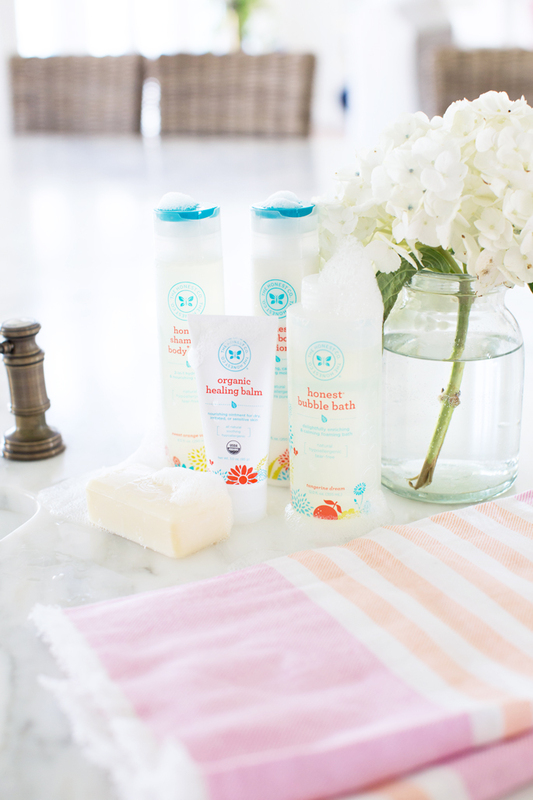 I’d love to try the Honest shampoo + conditioner when my baby girl arrives this winter! I am excited to try the healing balm! What an awesome giveaway. While I love their baby products, I would love to try their cleaning and laundry products too. I think their little diapers are adorable. Gonna have to get some for my little girl! I would love to try the bubble bath, as I think my little one would love it! It’s hard to choose just one favorite! I’m expecting my first in October so if her skin is anything like mine in the winter (sensitive and dry) this will be so helpful! Most excited about the honest shampoo and body wash! I love their shampoo and body wash! I would LOVE to try the candle! Most excited about the bubble bath! One thing I love is the Canvas Tote!! Use it everything as its sturdy and fashionable. What else could a mom want? But I would be most excited about their shampoo and conditioner. Expecting our first, so excited about the bath products! Hi! I’m really loving the multi-use shampoo/body wash in sweet orange vanilla! As a college student, funds are tight but this combination is just the best both financially and practically! I am most excited about the bubble bath! I haven’t tried it with my 7.5 month old and I think she would love it too! I love The Honest Company laundry detergent! Especially since it seems like we’re always doing laundry! Love their products! And love your blog! Thanks for hosting! I’m expecting my first baby in October! I’d be most excited about trying out the bubble bath. I’ve heard that all of their products smell amazing! Such sweet photos! I love Honest but haven’t purchased anything from them in a long time. I just checked out their site and I can’t believe how many more products they have. The body scrub sounds devine! I am a major lover of anything that sloughs off dead skin & exfoliates, and the fact that it isn’t made from harsh chemicals! I would love to try The Honest Company’s body scrub! I love Honest products. My favorite is the shampoo and body wash, its so mild yet smells great and refreshing! Since my daughter was born, I’ve also been using the diapers and wipes, I love the quality and design! People that have helped changed my daughter’s diapers have also commented on how great the diapers are!! I’ve been recommending Honest to all my friends! What an adorable post and thoughtful giveaway! My husband and I just found out that we are expecting our first child, so we are super excited and want to start preparing for his/her (maybe twins!?) arrival. I would love to try some of The Honest Company’s household cleaners and laundry detergent to create a gentle daily environment. I would also love to try some personal care products, like the deodorant, body scrub and body lotion so that my body isnt absorbing toxic chemicals while the baby is growing. I am really enjoying your posts about the baby and motherhood, so helpful as a young, first time mom! I can’t wait to use the Honest Shampoo for my baby. She’s due in September and i’m so excited for bath time:) Honest products will help me give my baby a bath without having to worry about what harsh chemicals she is being exposed to! Excited about the candles and bubble bath! Sounds like mommy heaven. The sea salt and sugar body scrub! Your daughter is adorable and love all the outfits! I have 3 1/2 month old, she’s so fun! We also use honest, love the diapers! Are you nursing your daughter or do you give her formula? I may need to supplement soon and was wondering if you had to and which formula you’d recommend? So adorable! I love your kitchen. Where did you get your faucet? Hello, I’m not sure if you respond to your comments but I am absolutely in love with your kitchen. We are currently building our dream home and I need to know something….where are your kitchen faucets from? I have been looking and looking but the finish is unique and hard to find. Could you please share this information with me, it would be of great help. I have to say you have a beautiful family as well, may God bless you!! I know it has been a long time, but do you remember where you got the navy & pink rug from? So cute! Thank you.